A mixture of Cambodian hospitality ,Asian exotics and Indochinese charm await to Phnom Penh .It situated at the confluence of the four rivers .Known as < Tonle Chaktomuk > -upper Mekong river , lower Mekong, Tonle sap and Tonle basac . Phnom Penh is a city of 2 millions people , the capital of Cambodia and the country's commercial , economic and political center It is also comparatively fresh travel destination .An adventure destination in the 1990s , t Cambodia ,Phnom Penh is fairly young ( only 579 years old -1434 -2013). only rising to the role in 1866 ,but it still a city steeped in tradition and history .Offering several cultural and historical sights .A port/trading village and occasional capital city in the post Angkorian period .The city came under French colonial controlled from 1863-1953 .flourished in independence in the late 1950s through 1960s , was besieged and then evacuated by the Khmer Rouge in the mid and late 1970s., repopulated in the 80s ,revitalized in the 90s and now undergoing rapid change and development . Much of the city including Royal palace , national museum was built during the French period . You may notice the old in classic colonial yellow amongst the southeast Asian shophouses and traditional Khmer pagodas and markets .The national museum in Phnom Penh is the most significant public repository of Khmer artifacts in the country ,displaying many Khmer important Angkorian artifacts and rare pieces from late period, Historical sites from the Khmer Rouge period including Toul Sleng Genocide Museum and Cheung Ek memorial . Phnom Penh is also a gateway to Cambodia ... the temples Angkor near Siem Reap in the west , the beach of Sihanouk ville and coastal town on along the southern coast , minority people , jungles and wildlife of the northeast province and the wide unspoiled countryside of rice paddies .little villages and loss temples across the country . Once known as the ‘Pearl of Asia’, is the capital and largest city in Cambodia. It is now a cultural, commercial, and political center that offers a unique blend of traditional charm and urban bustle. 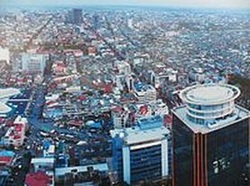 Today, Phnom Penh is a place of diverse economic and urban growth. A swift wave of development has brought in new highrise buildings--including a 30-storey business center--restaurants catering to every palate, and stylish hotels promising all levels of luxury. Contributing to this development are burgeoning culinary and nightlife scenes that can rival any other in the region. The alluring capital city also features a wide variety of historical and cultural attractions, along with myriad opportunities to sample local Cambodian culture. Here, classic colonial facades endure alongside sleek new eateries, golden-spired pagodas, and buzzing markets-- all evidence of the dynamic energy of Phnom Penh's city streets. 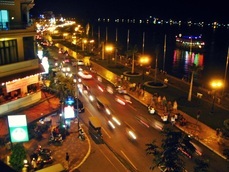 Phnom Penh's famous riverfront is lined with trendy pubs, bistros, and restaurants. Stores offering beautiful Cambodian silk products and chic galleries dot the side streets. Add to this a blooming arts scene and a heady dusk-to-dawn nightlife and you'll understand why Phnom Penh has become such a well-loved and compelling tourist destination. 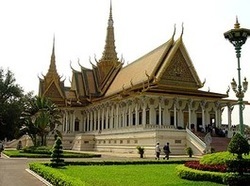 Cambodia's Royal palace , located along Sothearos Boulevard , was built in 1866 , during the reign of king Norodom . Points of interest in side the palace includes :Prasat Tevear Vinichhay ( the thrown hall ): the hall where the kings and queens are crowned )Prasat Khemarin : the hall where the monarchs live. Prasat Samran Phirum : the hall where the monarch rides the royal elephant.Hor Baku or Hor Preah Khan : The hall where the throne objects and accessories are kept.Chan Chaya : The hall where royal Dance performers train, in front of the Chan Chaya , there is a platform where the king can hold audiences with his subjects and all levels of officials . The Royal Palace of Cambodia is a complex of buildings, even though it is generally understood to be the royal abode of the King of Cambodia. The compound was the citadel of King Ponhea Yat (1393-1463) and rebuilt to its present state in 1886, when King Norodom (1834-1904) relocated the royal capital from Oudong to Phnom Penh. The buildings with beautiful towering spires are a great example of classic Khmer architecture found in Cambodia today. Along with numerous other interesting buildings within the 183,135 square meters (421m x 435m) compound is The Khemarin Palace, also known as Prasat Khemarin or the "Palace of the Khmer King." This is officially the residence of His Majesty, King Norodom Sihamoni. Inside the palace grounds, the noises from the street are silenced by the high walls surrounding the compound. While tourists cannot enter the area of the royal abode, visitors can gain entry to the Throne Hall (Preah Tineang Tevea Vinichhay) where coronations and official ceremonies take place, the Temple of the Emerald Buddha (Wat Preah Keo Morakot), Stupas (Chedei), a Royal Dining Hall, the Chan Chhaya Pavilion and a French-style building that was a gift from Napoleon III. The staircase leading into the pagoda is marble, and inside, two breathtaking representations of the Buddha hold court. The Emerald Buddha is in fact made of Baccarat crystal, and dates back to the 17th century. A small glass case nearby enshrines a sacred Buddha relic brought from Sri Lanka in 1956 by the Venerable Loeva Em of Wat Lanka. However, the second statue of Buddha is the one that catches the eyes of visitors. Its 90 kilo gold body is studded with 2086 diamonds; the largest of which a 25 karats brilliant piece can be found on the Buddha's crown. Cast in 1904 by King Sisowath at the request of his elder brother King Norodom, it represents Maitreya Buddha, the future Buddha. There are a total of 1650 items on display at the temple. They include cast gold headdresses made especially for the royal dancers, many solid gold Buddha statues in different forms, gifts from royalties and dignitaries from around the world and a myriad of jewels and precious antiques. 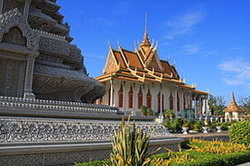 The buildings are inspired by Khmer temple architecture and house more than 14,000 items. 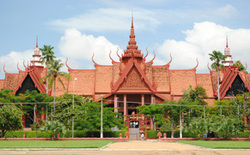 The National Museum contains the world’s largest collection of Khmer art, including sculpture, ceramics, bronzes, and ethnographic objects dating from prehistoric times to periods before, during, and after the Khmer Empire. The Museum also serves a religious function. Its collection of important Buddhist and Hindu sculptures includes a Post-Angkorian Buddha supported by UNESCO. 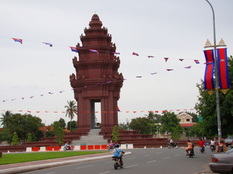 Built in 1958 as a memorial to Cambodia's war dead and to celebrate independence from foreign rule, the monument stands majestically on the intersection of Norodom Boulevard and Sihanouk Boulevard in the centre of the city. It is designed by the influential Cambodian modern architect Vann Molyvann in the form of a lotus-shaped stupa in the same style seen at the great Khmer temple at Angkor Wat and other Khmer historical sites. The monument consists of five tiers decorated with 100 Nagas and is most impressive in the late afternoon hours when the sun casts shadows over the sculptures. Cambodia celebrates Independence Day on 9 November each year. The Independence Monument, already one of Phnom Penh’s most significant structures, becomes even more celebrated when His Majesty King Norodom Sihamoni leads the annual jubilation by ceremoniously lighting a giant torch placed inside the monument in front of a huge spectator of high officials from the government, private sectors and members of the Cambodian public. Toul Tum Poung market is often referred to as the Russian market because of its popularity among Russian expatriates during the 1980s. This market is popular to collectors of genuine antiques; also, for those looking for good reproductions. Filled with stalls selling sundry souvenir items (silk scarves and bags, woodcarvings, etc.) 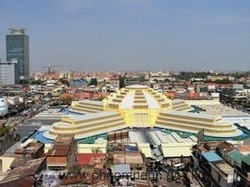 and clothing, Toul Tum Poung is a well-frequented market among tourists. Additionally, a handful of air-conditioned "export" shops have cropped up that offer factory over-run designer clothing at hugely discounted prices. The night market in Phnom Penh, located in front of the Phsar Chas (Old Market) near the riverside, is perpetually crowded with tourists in search of a good bargain. At the moment, there are more than 150 stalls selling an array of items from clothing and ornaments to furniture and souvenirs. 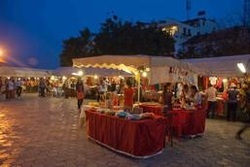 The entire setting of the Phnom Penh night market is made from natural material, and there are occasionally music performances and entertainment acts. The riverfront offers some of the city’s most interesting sites including dozens of pubs, galleries, cafés, restaurants and shops that sit along one side of Sisowath Quay overlooking the Chaktomuk (the confluence of the Tonle Sap, Mekong and Bassac Rivers). The park-like riverside is a great place to absorb local flavours and watch the locals unwind and enjoy a late afternoon stroll on the esplanade. Early risers may wish to check out the spectacular sunrise over the river in front of the Royal Palace. The mighty Mekong River is indeed, in more ways than one, the lifeline that runs through the heart of southeast Asia. Rising from the Himalayan mountain of Tibet, it trickles and gradually winds its way through China, Myanmar, Thailand, Laos, Cambodia and Vietnam before spilling into the South China Sea. In its course, the mighty Mekong meets the Tonle Sap Lake which is the largest lake in South East Asia and effectively, the heartbeat of Cambodia. The annual pulsation of the flooding seasons has been a huge contribution to Cambodia’s existence for millenniums. When in Cambodia, tourists are urged to explore these timeless waterways by taking a cruise up the mighty Mekong and discover the amazements at the center of the Tonle Sap Lake. There is a huge community living on the lake itself. This is definitely a gentle and wonderful way to experience local life that has remained unchanged for centuries. Tourists can stop off to have a cuppa at a floating café in the middle of the lake, watch the small communities along the riverbank, visit remote temples far from the beaten tourist paths and enjoy the river breeze. Tourist boats of varying size and quality wait along the riverfront, usually between Street 144 and Street 130, and at the Passenger Port near Street 104. Just look for the cluster of boats and advertising placards. From about 4PM-5:30PM you can get a sunset cruise for $4-5$/person on a shared tour boat. If you want a private boat, or arrive anytime other than the sunset hours, boats run about for $10-$15/hour for a whole boat and offers a standard tour itinerary. Bring your friends and split the price. Prices go up for larger boats. In the evening, the riverside along Sisowath Quay offers many night cruises up and down the Mekong River, some with dinner included. These cruises can be quite a romantic experience and best of all, they're usually very affordable. Prior to 1975, Toul Sleng was a high school. 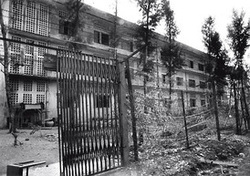 When the Khmer Rouge came to power it was converted into the S-21 prison and interrogation facility. Inmates were systematically tortured to extract confessions, after which they were executed at the killing fields of Choeung Ek. S-21 processed over 17,000 people, less than a dozen of whom survived. The building now serves as a museum, a memorial and a testament to the madness of the Khmer Rouge regime. Located about 17km south of Phnom Penh, Choeung Ek was once an orchard and a Chinese graveyard. 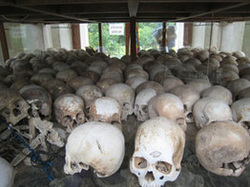 It was used by the Khmer Rouge regime as an execution ground to put down thousands of people between 1975 and 1979. The site is now better known as the Killing Fields. Mass graves containing thousands of bodies were discovered at Choeung Ek after the fall of the Khmer Rouge regime. Many of the dead were former inmates in the Tuol Sleng prison. Today, Choeung Ek is a memorial, marked by a Buddhist stupa. The stupa has acrylic glass sides and is filled with more than 5,000 human skulls; many of which are either shattered or had evidently been smashed. It is believed that the Khmer Rouge soldiers kill their victims by smashing them on the head, in order to save on bullets. The origin of the Ounalom Pagoda can be traced to as far back as the 15th Century. It was built in 1422 by King Ponyea Yat, the last king of the Khmer empire. 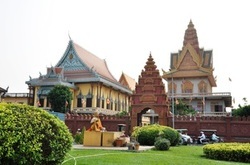 It is one of the five original monasteries in Phnom Penh that King Ponhea Yat had built. 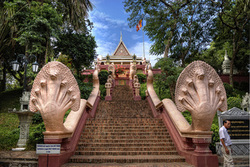 Wat Ounalom is recognized as the ‘headquarters’ of Cambodian Buddhism. The patriarch, the chief abbot of Cambodia, resides here. The compound, forty four buildings in all, is about 250 metres north of the Royal Palace along Sisowath Quay at the river front. This monastery was home to over 500 monks and housed a huge library consisting of over 30,000 titles. During the regime of the Khmer Rouge, many of the buildings along with many religious statues and symbols were damaged, but most of which have since been restored. The buildings are used for a variety of purposes. There is the temple itself, schools, libraries, living quarters and the stupa that gives the temple its name; the stupa holds an Ounalum, a hair from the eyebrow of the Buddha.